According to a report from the folks at BassFan.com a high school teacher named Gabe Keen caught and landed a 15.20 lbs largemouth bass which when and if it’s certified, would take down the previous state record catch of 14.80 lbs caught back in 1954. Keen caught the bass using an umbrella rig paired with fluke style soft plastics. The bass was weighed in at the Bi-Lo grocery store’s certified scale in Soddy Daisy, TN. Local favorites typically don’t win the Bassmaster Classic, at least that’s what they say. On Sunday February 22nd, 2015 Casey Ashley did just that. Over three days on Lake Hartwell in Greenville, SC, Ashley targeted bass using a pearl white Zoom Super Fluke rigged on a homemade fish-head spinner made by his father Danny. 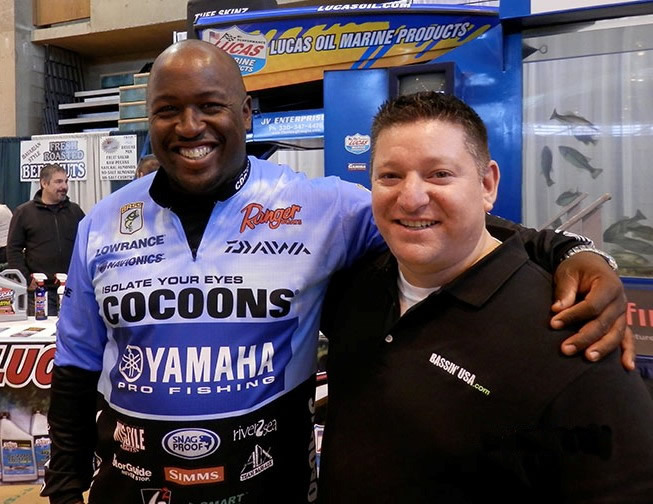 Bryan Basher senior editor at Bassmaster.com quoted Ashley “I was going out and getting a good limit with that bait and then going and fishing brush piles and structure looking for big fish with a jig,” Ashley said. “I burned a lot of time doing that the first two days. Governor Andrew M. Cuomo’s is proposing a hunting and fishing licenses restructuring program. On February 20, the Governor’s office announced NY Open for Fishing and Hunting, a plan to streamline hunting and fishing licenses and reduce license fees to support tourism opportunities and benefit sportsmen and sportswomen throughout the state. The proposal is part of the 30-day amendments to the 2013-14 Executive Budget and would reduce fees paid by hundreds of thousands of hunters, anglers and trappers while maintaining support for the states fish and wildlife programs. Williams’ fish breaks a state record held since 1999 when William Cross caught a 14-lb. 11.52-oz. bass from Broken Bow Lake. WYNNE, Ark. – Almost 36 years to the day, Arkansas’s largemouth bass state record has finally been broken. On Tuesday, Paul Crowder of Forrest City set the new record on Lake Dunn near Wynne. Crowder’s lunker weighed 16 pounds, 5 ounces, breaking the old record by just a single ounce. Aaron Mardis of Memphis had held the state record since March 2, 1976. Mardis’ 16-4 fish was caught on Mallard Lake near Manilla in Mississippi County. Lane brought 51 pounds, 6 ounces to the scales over three days to claim the 2012 crown of professional bass fishing and the $500,000 first-place prize. It was his first Classic win. LAKE HAVASU CITY, Ariz. (Feb. 25, 2012) – Troy Lindner of Los Angeles, Calif., weighed a five-bass limit totaling 19 pounds, 6 ounces Saturday to win the EverStart Series Western Division event on Lake Havasu with a three-day total of 15 bass weighing 49 pounds, 11 ounces. For his victory, Lindner earned $29,665 and a Ranger Z518 with a 200-horsepower Evinrude or Mercury outboard motor. Chris Lane WINS the 2012 Bassmaster Classic with 51 lbs. 6 oz! Lane says he committed to fishing for 5 big bites and not focusing on just catching a 10 or 12 pound limit. Chris said that “he remembers watching the classic since he was 4 years old”… now he’s living his dream! The big turning point was making the right call and sticking to his key area… he was immediately rewarding with his biggest bass of day. SHREVEPORT-BOSSIER CITY, La. — No group, not even farmers, talk about weather more than fishermen, especially when big changes are blowing in the wind. So there was lots of weather chatter among the 49 competitors on the day before the Bassmaster Classic begins. A southwest wind howling up to 30 miles an hour provided the background noise at media day Thursday, as temperatures rose to 80 degrees. When takeoff begins on the Red River at 7 a.m. Friday, the wind will have shifted to north-northwest and the temperature is predicted to be 46 degrees. Wind speeds of up to 25 miles an hour will make it feel colder. “The weather (Friday) is going to be the biggest thing in this event,” said Mark Tucker of Kirkwood, Mo., who is fishing in his eighth Classic. “The wind is going to dictate everything.